Have any of our hopes come true since the first Watch? 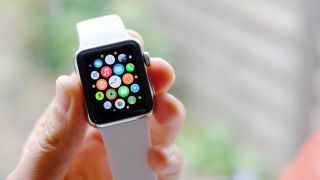 Announced in 2014, but launched many months later in mid-2015, it felt like a long time before we could brandish the Apple Watch on our wrists in public and share our full verdict of Apple's first smartwatch. Our original Apple Watch review at the time praised it for its clever interface and stylish design, but criticized it for a high price and limited battery life. We gave it 3.5 stars out of five, but our Apple Watch 2 and Apple Watch 3 got 4 stars and 4.5 stars respectively, so you can see it's certainly improved. This is one we’re surprised Apple hasn’t managed to fix yet. Many smartwatches now come with an always on display. Take, for example, the Ticwatch E and Ticwatch S that both sit in our best smartwatch list both come with an always on display so you can always keep an eye on the time. That’s something you still don’t get on the Apple Watch, even if you own the latest generation. You can fiddle with the settings on all three versions of the Apple Watch to be able to keep the display on for 70 seconds after you've woken it, but that’s not like just being able to see the time on your wrist without having to move at all. Yes, Apple has one of the best 'raise to wake' implementations on the market. That obviously saves battery life as it only lights up when you tap on the watch or raise it up to read the time, so it's a surprise Apple hasn’t developed an always-on option as well. Perhaps watchOS 5 will be when we see the introduction of always-on, especially considering the rumors suggest Apple is ready to open up watch faces to third to third-party developers for the first time. However, it's more likely an all-new device will need to be created, one that packs a new layer of technology in for a new 'eco-mode' that switches out when you raise your wrist. You can do most exercises with the watch - that’s true - but it’s a jack of all trades. If you specifically want a watch for running, the technology has progressed but there’s a long way to go before we can recommend this specifically for this task over something like the Garmin Forerunner 735XT. You still can’t import your exercise data into Strava to share your workouts on the most popular running social network, and although we've often found the heart rate monitor to be more accurate in later models, it can sometimes give slightly inaccurate readings. Each passing generation of the Apple Watch has seen improvements, with the addition of GPS on the Apple Watch 2 (which was improved again on the Apple Watch 3) and a waterproof design that allows you to track your swimming goals too. It is still developing – back in March this year Apple updated the Watch 3 with new workout features for both skiing and snowboarding, which is something you won’t get on a lot of other sports watches. Yes, it’s getting better, but the fitness features still don't quite have the level of execution we longed for three years ago. This is perhaps the number one criticism we've heard of all versions of the Apple Watch, which has had a very limited design changes over the first three generations. It’s essentially the same watch as we’ve seen before made of different materials and a few varieties of paint job. With the love for the circular Android Wear-toting Moto 360 at the time the first Apple Watch debuted, many were surprised the company went for a square design. We had seen square watches such as the Sony Smartwatch 3, but the Apple Watch looked different to that model, combining sweeping curves with a more usable display. Back in 2015, Beavis wrote in his review of the original Apple Watch, “All of Apple's flowery marketing rhetoric about reinventing the classic watch look - from digital crown to complications - didn't end up translating into that that traditional round watch design, which is one of my largest criticisms with the form factor. Today his opinion has changed. He does still believe it's easier to interact with a square watch, but he now also believes that the shape has pervaded and Apple has made this design something deeply associated with the brand. Beavis said on the three year anniversary of the Apple Watch, "It has made an unloved design iconic in the way Apple can do." Of course, there were things we couldn't have predicted - or, more accurately, that we didn't imagine would happen. As mentioned, GPS came on board to make a big difference and offer an easier way to leave the phone at home - and with music streaming now on offer too, it's possible to use the Apple Watch as a completely standalone device. But talking of leaving the phone out of the equation, there are a number of companies suddenly dropping support for their standalone apps, meaning that if you're not connected to your phone then you won't be getting the updates you might expect. With cellular capabilities now embedded, that seems like an odd choice, and perhaps shows that Apple sees this firmly as a second screen to a connected phone, unless you're out exercising... in which case, so many distractions might not be wanted. But then again, maybe it's just a change of direction. If the mooted StreamKit is launched at WWDC 2018 later this year, apps like Spotify and others could be easily added into the mix, allowing offline playback of tracks and push notifications by third party developers without a phone present. That's a big 'could' as the service hasn't been confirmed - but should it launch, the Apple Watch could be seen as a fusion between function and fitness... and perhaps even Apple Workouts can by synced to Strava. Will we see changes soon? We may see all three of these things change on the Apple Watch 4 or with the watchOS 5 software update. The company has shown no intention of opting for a round watch face, but we've seen lots of patents for the circular shape over the years, so Apple may be able to surprise us with a big change. Considering the Apple Watch has sold so well, it seems that decrying the square face back in 2015 was incorrect… but the always on display and expanded fitness features are still something we want as soon as possible, and if later this year Apple debuts the Watch 4, it's the perfect time for buyers to get them.